Mr Morris and Mr Jenkins gift us on Christmas Eve with an urgent request to break the political link between sovereigns and banks. “Lower levels of Returns on Assets lead banks to invest more heavily in government securities, and coherently the smaller the differential between the risk-weighted return on loans and securities, the more the banks tend to invest in government bonds. (…) (This happens as) government securities purchases represent a means of increasing earnings because their yields rise sharply” precisely when agents default on loans and demand more liquidity. The causal nexus is established from tighter lending conditions to increasing public debt purchases and not the other way around. The political link is pervasive in countries where prominent public banks include public officials on their management board; but adjusting risk-weights to those suggested by the BIS to address this issue would ignore the fundamental role of sovereign yields in anchoring banking to the real local economy. Mr Morris, Mr Jenkins and the departing head of the Single Supervisory Mechanism Ms Nuoy are correct when saying that it is important to break the political link between banks and States that manifests itself in higher public debt purchases. Because the link is not equally important across Member-States (in some Member-States, public banking represents 40% of banking assets), it shouldn’t warrant a systemic solution such as changing risk-weights while it shouldn’t be ignored. 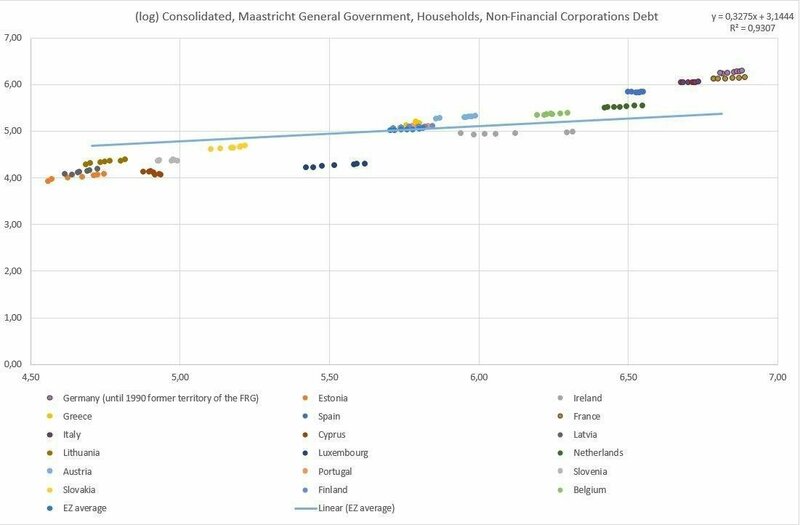 The chart below plots Maastricht and non-Maastricht Member-State debt. The chart shows how public banking dramatically changes the distribution of public debt in Europe – and how relevant it is to household earnings and welfare.